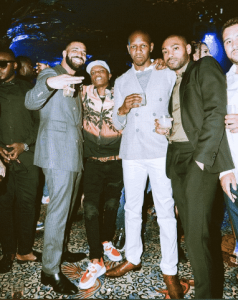 Drake put together a party to celebrate the release of his fifth studio album Scorpion and our very own Star boy, Wizkid was there to celebrate with his friend. The relationship between the two music stars started in 2015, when the Canadian rapper jumped on the remix of Wizkid’s street anthem, Ojuelegba. The relationship has since produced two other collaborations namely; One Dance and Come Closer. From these collaborations the music chemistry between the two artistes was established but there have been rumors that they do not have a relationship outside of work. The rumor was fueled by Wizkid’s absence in Drake’s Come Closer video and Drake’s “revenge” on the Come Closer video. It was easier to believe the rumor since there was no image or video to prove that Wizkid and Drake had actually met before their recent link up at the Scorpion listening party in London. Each time a picture of a Nigerian-based artiste (Burna Boy and Tekno precisely) with Drake surfaced, the topic of the space between Wizkid and Drake was brought up. However, with the pictures from the party in London now on the internet, the rumor has been silenced. Wizkid shared the pictures on his Instagram page as he congratulated Drake on the success of the Scorpion album. Is Wizkid’s “Superstar” Album The Best Album We’ve Ever Heard In Nigeria?